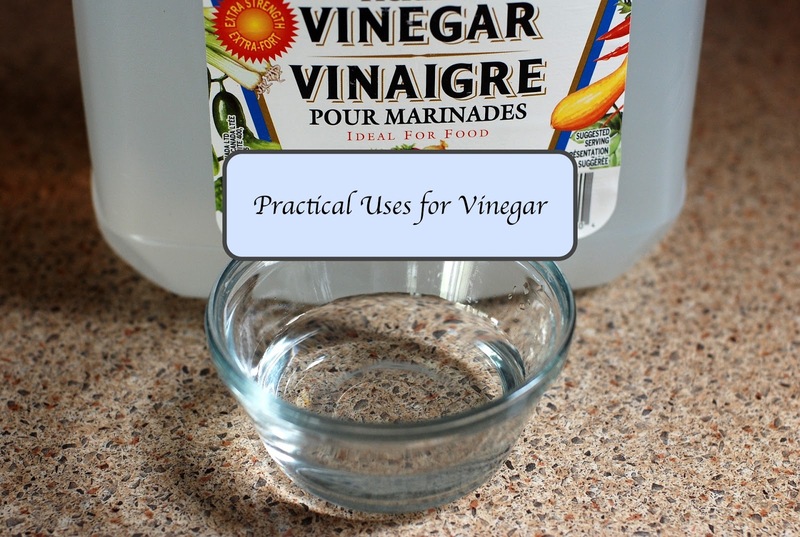 If you don't have a gallon of good old cheap white vinegar at home, go out an buy yourself a jug! It is super cheap and has so many uses. I'll list just a few down here. Also very useful is apple cider vinegar, which is not too expensive either! I paid around $2.50 at Walmart for a gallon of white vinegar and a little more than $4 for a gallon of apple cider vinegar. Raw apple cider vinegar, which is more expensive, will cost around $4 for a quart at most Walmarts and grocery stores. 1. Salad Dressing - add either to your favorite dressings according to recipe. My favorite is the Good Season's brand, but you can find a homemade version of it here. This is one I've been meaning to try and I love Budget 101! 2. Weeds - spray full strength on weeds and vines such as poison ivy. They will shrivel up in die in a few days. Be careful not to get it on any plants you want to keep, however. They will also shrivel up and die. And be forewarned, your yard will smell like a pickle for a short time. It's worth not using the chemicals in my opinion, though. 3. Cleaner - Fill a spray bottle with half water and half vinegar and use as a surface cleaner. You can also add a few drops of dish detergent for extra degreasing power. For a better smell, try adding a few drops of your favorite essential oil. I like pine needle oil. 4. Drain Cleaner - Along with baking soda, vinegar can clear clogged drains. Just put some baking soda in your drain and pour a good amount of vinegar on top of it. Watch it bubble. Wait a half hour and then run water. If your drain is still clogged, repeat. For maximum effectiveness, it is important to clear any visible hair or other objects from the drain first. 5. Mold Killer - If you need to kill mold or mildew, you can spray vinegar full strength onto a surface and let it dry. I've done this with old furniture. I have also used other natural mold-killing recipes, but by itself, vinegar is claimed to kill up to 82% of mold species. 6. Fabric Softener - In our house, a couple of us have sensitive skin, so we can't use all the scented products available. In my search for natural fabric softeners, I came across using white vinegar. All you do is add a half cup to the softener dispenser in your washer. It really does work. If you want more softening action with a nice smell, check out this recipe for fabric softener made with hair conditioner. To keep it all natural, just use an all natural conditioner! 7. Anti-Fungal Athlete's Foot Spray - Fill a spray bottle with half vinegar and half water and spray on feet as needed. For this one I use apple cider vinegar, but I have read white vinegar is just as beneficial, having the same anti-fungal qualities. 8. Sunburn relief - When I was in high school somehow I managed to get a second degree sunburn. It was horrible. My skin is fair and I have never been one to tan, just freckle. Here's how it happened. A woman I used to babysit for asked my friend and I to come to the beach with her. It was a nice day and not too hot. I decided to wear a sundress and, actually, I never even went swimming. I thought I was covered up enough and the cloud cover was quite thick. That coupled with an ocean breeze led me to believe that the sunscreen I had applied would certainly be enough. Well, I must not have applied enough to my back because when I got home I was in searing pain. And, unfortunately for me, my birthday party was the next day. Up to that time, if I ever got a sunburn it was mild enough to feel better when I woke in the morning. Not this burn. My mom had a remedy, though. She filled a bottle with vinegar and water and we sprayed it on my back to ease the burning. For my party, we were all planning on sleeping outside in my backyard in our huge 3 room tent. Well, all night, as the pain came, I sprayed vinegar on my back. It really did help with the pain, but I'm not sure how my friends dealt with the smell. It was like a pickle factory! All this to say, vinegar can ease sunburn pain but use with care so you don't stink your friends out! 9. Beverage - Yes, I drink vinegar. It is actually an age-old remedy for arthritis and health in general. For beverages, I use apple cider vinegar. I would not recommend white vinegar. The recipe comes from Trim Healthy Mama, and even if you don't follow that way of eating, daily apple cider vinegar is recommended for general health. What I do is put 1 tablespoon of raw apple cider vinegar, 1 teaspoon of ground ginger and stevia to taste in a 1 quart pitcher. Then to drink, I pour over ice. It sounds like it might taste funny but it doesn't at all. I've tried to consume vinegar in the past with other recipes that have failed me. This recipe, though, is a keeper and I enjoy it even if I'm not following the THM plan. It's something I drink regularly.